Giulia was the name chosen by her parents Anselmo Valle and Cristina Dalbar. She was born in Aosta on the June 26, 1847 and was baptised on the same day in the ancient collegiate church of Saint Orso. She spent the first years of her life within a happy family who rejoiced at the birth of another child – Vincent – and where the parents’ ran a milliner’s shop and a solid commercial activity respectively assured a certain welfare. But her mother died when Giulia was four. The two orphans were thus entrusted first to the care of the paternal relatives in Aosta and later to the maternal ones in Donnas. Here they found a calm environment The school, catechism and the preparation for the sacraments took place at home under the guide of a priest who happened to be a family friend. When Giulia was eleven, she was sent to France in Besançon, in a boarding school run by the Sisters of Charity where she could continue her schooling. Her separation from her family cost her a new suffering, a new experience of solitude directing her towards a deep friendship with “the Lord who keeps her mother with Him”. In Besançon she learned French thoroughly, enriched her culture and became skilful in housework. Her delicate goodness matured and it rendered her loveable and attentive towards the others. Five years later, Giulia returned to her valley, but her house at Donnas is no longer there. Her father got married again and moved to Pont Saint Martin. Here the familiar situation is strained and living together was not so easy. Her brother Vincent could not stand her: he went away alone without receiving any more news from him….Giulia remained, and out of her solitude cropped up the stimulus to seek what her family couldn’t provide for her, to look after those who experiment her same sorrowful event and find out ways and means to express friendship, understanding, kindness and goodness for everyone. In that period, the sisters of Charity came to settle at Pont Saint Martin. In them, Giulia rediscovered her teachers of Besançon, the daughters of Saint Jeanne-Antide Thouret who give her help and encouragement. She observed the life-style that they offer to God and to the others and chooses to become one of them. When her father presents her the suggestion of a prosperous marriage, Giulia doesn’t hesitate: she promised her life totally to God : she only desired to become a Sister of Charity. On the 8th September 1866 her father accompanied her to the Monastery of Santa Margherita in Vercelli where the Sisters of Charity run a noviciate. A new, peaceful and joyful life starts for her in spite of the suffering separation. It’s now a matter of building a deeper relationship with God, of knowing herself and the mission of the community in order to accomplish God’s will. Giulia started joyfully her new journey. Every day she discovers what she must lose or acquire: “Jesus strip me of myself, let me be wrapped in you. Jesus I live for you, and I die for you…” is the prayer that accompanied and would continue to accompany her during her lifetime. At the end of the novitiate, together with the new habit she received a new mane: Sr. Nemesia. It’s the name of one of the earliest martyrs of the church. She is happy with the name and makes out of it a life’s program: to witness at all costs, totally and for ever her love for Jesus. She was sent to Tortona, to St. Vincent’s Institute where she found several activities: an elementary school, cultural courses, a boarding school and an orphanage. She taught both in the elementary school and French in the higher classes. That’s the favourable ground where she could sow kindness. Sr. Nemesia was present where humble work needed to be done, where there was pain to be relieved, where apprehension hindered good relationships, where fatigue, pain and poverty put limits to life. Everyone was convinced to have a particular place in this heart that knew no boundaries: Sisters, orphans, pupils, families, poor, the clergy of the nearby seminary, young soldiers of the numerous barracks of Tortona turned to her and sought her as if she were the only Sister present in the house. Her charity had no limits. In Tortona she was called “our angel”. In the morning of May 10, 1903 , the orphans and the boarders found a message addressed to them from Sr. Nemesia: “I am leaving happily, I entrust you to our Lady… I shall follow you in every moment of the day”. She left alone at 4 o’clock in the morning, after 36 years… In Borgaro, a small country in the vicinity of Turin, there is a small group of young girls waiting to be accompanied along a new path, towards the total self-gift to God and to serve him later in the poor…They are the novices of the new province of the Sisters of Charity… The method of her formation always remained the same: that of kindness, understanding that educates to renouncement out of love, patience that knows how to wait and how to find the correct way that is convenient to everyone. Sr. Nemesia’s path neared the end. Already thirteen years had passed since her arrival in Borgaro. About five hundred novices have learnt from her how to walk on the paths traced by God. She has given everything: now the Lord asks her to hand over even her novitiate to others. The prayer that has become hers since the beginning: “Jesus strip me of myself, let me be wrapped in You” has accompanied her throughout her life. Now she can say “I don’t exist any more”. She has given up everything. It’s the perfect offering of an existence fully offered to Love. 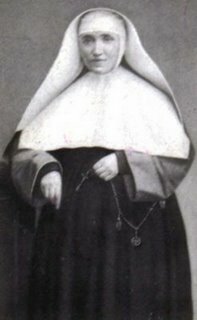 Sr. Nemesia died on the December 18, 1916. Beatified by Pope John Paul II on April 25, 2004, her mortal remains are venerated in the church of the Institute of Bedworth. “O Virgin all pure, Holy Mother of Love you need to humility all your greatness, I find no more right to beg for help me win my pride. This entry was posted on Thursday, December 18th, 2008 at 5:02 am and is filed under Beatified by John Paul II, Catholic. You can follow any responses to this entry through the RSS 2.0 feed. You can leave a response, or trackback from your own site.